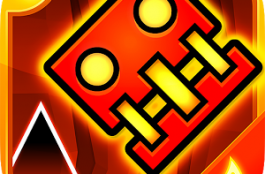 Geometry Dash Meltdown Becomes one of the craziest games and impossible have seen on mobile devices, even one that has appeared in videos of the most popular youtubers, Geometry Dash is here Meltdown. The game created by Games RobTop has half a world gone mad for its difficulty and so addictive that it returns both Android and iOS with its new form, will it continue to maintain the level ?. 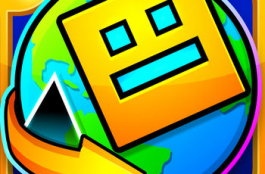 Geometry Dash is a game that needs no introduction and has managed to gain a foothold in the game called impossible. 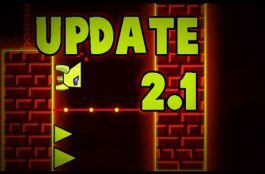 The formula has not changed much rather have been renovated in Geometry Dash Meltdown. Tell them that in this new version we have at the moment with only 3 levels as the next are still with the sign soon. 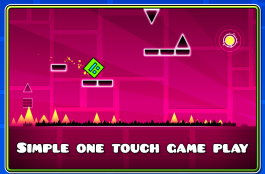 These three levels quickly show us the essence of Geometry Dash senses having to squeeze our best to not explode.The game begins with our brave colorful cube moving full speed into the barriers, accompanied by electronic music that fits perfectly with the rhythm of the game. Our goal is simple tap the screen to jump and avoid obstacles until reaching the end of the level. It sounds simple but it hides a lot behind this idea as obstacles will change as we move forward complicated and playing with us to take the fall. 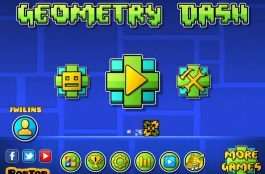 One of the formulas that have this Geometry Dash Meltdown, and already infuriated more than one player in its previous version, it is the ability to confuse and take the player where it will. To use this type patterns jump, jump for jumps repeated several times to just after changing a single part to bring ruin to do without realizing what we have repeated above. Therefore, this is a game that requires concentration, patience and many attempts. Geometry Dash Meltdown are quite varied from spikes, pits gears with teeth dangerous creatures. We also have areas in which there will tread the floor and we will be piloting a ship if we had take us to stamp us pushing against a wall, so keep yourselves vuelo.A good level and will have as we move forward we find new ways to jump as platforms that will blow us without pressing anything that looks like a help, but after a few minutes will be our worst nightmare. As we can see every obstacle or even employers platform is created to own all end with us. Luckily we have a practical way to see we face before introducing us to the levels of Geometry Dash Meltdown. Within this crazy colors, jumps and more jumps are few gold coins scattered throughout the map that already were in previous versions. These coins along with some objectives allow us to unlock new icons or from aspects and challenges for the player. Madness is back with this Geometry Dash Meltdown and has not lost a single one of its colors to do. It maintains that hook that has always captivated players that speed and that little response time you can count on. With one touch of the screen you land on a constant push on the game and it will take you to keep trying it is a very frustrating game and therefore very rewarding at the same time. 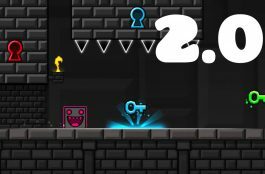 Undoubtedly they have achieved a great game with mechanics as simple thing that adapts to anyone who dares to take on the world of colors created by RobTop Games. Very colorful and sympathetic with the purposes of the most spectacular from beginning levels of simple design, logically to the speed at which you play this Geometry Dash Meltdown does not give us much time to admire the scenery but does his part well and adapts the style of play. No doubt the effects are the big hit of this section to be a show of light and color to each hop that manages to surprise the player. The section that most influences the game almost without realizing leading us to electronic songs F-777 to jump and do not stop jumping on each level to the beat of the music. Rarely we see a sound effect that influences both a game and at some point will want to know as follows even the thing that motivates you to want to overcome the most difficult obstacles song. Great support and push that rate that is perfectly suited to the game and what is required in the.